Recommendations: Listen to the piece “Struggle for Pleasure” by Wim Mertens and read the poem “The ballad of the Salt-Water” by Federico Garcia Lorca. 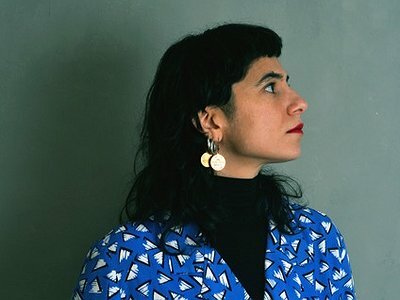 Website/ Contact: If you enjoyed this interview with FOS, head over to her website www.fosonline.co.uk for more information as well as current tour dates. And be sure to visit the website of her label Near the EXIT Music. I grew up on the island of Kalymnos. It’s a small island where you are constantly surrounded by the sound of the sea, the seagulls and the fishing boats. I grew up with traditional island music, also my great-grandfather Theofilis Magriplis was the master teacher of the traditional Kalymnian violin. My mother used to play the accordion and my father liked to sing the island songs. My grandparents loved to sing the Byzantine psalms. I moved to Athens in my teens where I discovered Wim Merten and was greatly influenced by his music. I remember composing my first piano piece around the age of 15. At the dance college, I was mixing different music pieces together with sounds for my choreographies and that was the first time I realised how creative you can be with sound. I had a Tascam 4-track when I was about 22 and started putting ideas for songs together to present to producers. After working with quite a few producers and discovering the creative potential of producing, I realised, that I wanted to do everything myself. So, I studied a bit of music technology around the age of 28 and started writing my own music under the name Fos. I love the ability that music and sound can take you to a completely new, mysterious and undiscovered place; where I feel this unknown satisfaction. Music and sound can travel into the soul like no other art form can; the sound waves speak directly to it. Music elevates the soul and develops the human spirit. When I make a piece of music, I make sense of and create meaning in my world. Music makes me feel love. When you realise what you want to do, then you realise what it is that you need to learn in order to achieve it. I have been hugely inspired by some artists. There was a need for me to filter their influence through myself and in some way, to interpret their impression on me. It gets really interesting when you combine all your very different influences. The result can be mind-blowing and it’s something that perhaps you would have never thought of creating from scratch. But as the years go by, this need feels like it has been fulfilled and your influences have all integrated into your music so much that you are not conscious of them anymore. You keep working, discovering new things along the way and you keep sharpening the edge of your pencil. I had to believe in the fact that experimenting would definitely take me somewhere. I had to trust myself. There are clichés in the producers’ world that I wanted to break free from and I had to believe in my vision in order to get to my goal. That’s also with regards to structure. There are no rules for me and I had to listen to my gut instinct. Over time, I have learned how to leave negativity out of my creative work and trust that it will reveal itself eventually. Confidence has allowed me to let go of control issues. My studio is still exactly the same as the very first one. All analogue gear, even an analogue mixer. I originally bought a pair of very good Mackie monitors which I am still very proud of. I have added little things like a small drum machine, two synthesizers, little instruments that I find in car-boot sales. I would like to become more portable in terms of my set-up, so I’m planning to buy some good quality equipment that I can take with me anywhere. The most important piece of gear for me though is my conch; a real Greek conch shell that I turned into the ancient instrument myself, by cutting off the end and cleaning the insides, it now produces a clear ‘A’ note. What a blessing. The ancient sound of the conch takes me to mythical worlds. The sequencer has become my music canvas of choice. I use Ableton and it's unbelievable what you can do with it. But I use technology just as a basic tool, I do not dwell on it. A lot of people spend months, even years, trying out all the different plug-ins and effects but in the end, they never make any music. Only a human can feel and can allow a music piece to get somewhere, connecting with the whole to become a vehicle of real creative force. The machine cannot feel, but it can be programmed to do crazy inorganic sampling or add strange midi effects that a human could never even think of let alone produce. The machine can be a good tool for the human. There is no co-authorship because I am directing everything and even when I let the technology tools run wild I still choose what works and what doesn’t, I start them and stop them. I am always the author. I’ve had many collaborations in the past and a lot of them ended bitterly. That left me feeling insecure about working with other people. But throughout the years, I discovered that I could slowly start trusting some close friends musically again. In my new album, one of my dearest friends, artist Johana Hartwig, is playing the violin. It’s the first time I’ve ever invited anyone to play on an album. I trust her very much and also we communicate musically, for example, we both love simple beautiful melodies. We talk about ideas and we inspire each other. What worked during the session was when I asked her to improvise on the backing track again and again. Afterwards I edited her beautiful takes. We’ve jammed together a few times but not very often because she lives in Cardiff. She is also a video artist; she filmed the video for ‘Captain Free’. Johana has always been so genuinely supportive of my music. For me collaboration, is very sensitive and special, based on trust and mutual respect. I feel harmonious having chosen the path of creativity which makes everything in my life blend peacefully. In the morning, after breakfast, I check my emails and after that I start working on my music. I love listening to what I have been working on for the first time in the day with fresh ears, because then, I can truly hear what’s happening and if I need to correct things. I get a good and clear idea of what works and what doesn’t. Then as I move on to correct immediately, I get into the music. Around lunchtime, I need to have a break and eat something, get outside and have a walk around, change the scenery, hopefully get some sun and relax. I always find an excuse to go to Ridley Road market. It’s so much fun; bright coloured African fabrics everywhere and the sound of reggae. It really puts me in a good mood. Coming back home after about an hour’s break, I continue working on my music for the whole afternoon until about 5. Then I get ready to either meet up with friends or go and earn some money by playing the piano. I am directing everything and even when I let the technology tools run wild I still choose what works and what doesn’t, I start them and stop them. I am always the author.